Akeron info | Kennel Ridge Rules! Akeron landed in my lap at eight weeks old. I originally picked another puppy but breeder Veronica told me that akeron where mine.... No discussion. As a little one he was nice and easy! That continued on and we did some obediance training and competition. Soon we realised that dog-showing where our thing! Both akeron and I liked it a lot and we also got some good results that made it even more fun. 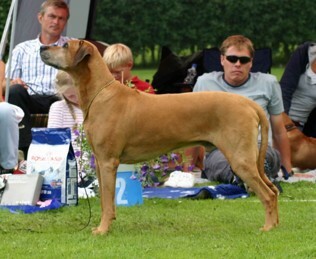 BIS Puppy at the Swedish RR Specialty Show in -98 where the first win. Now many years later we can look back at a show carrier that has been amazing! As a dog Akeron is calm and nothing gets him upset or afraid. He has always been able to ride in a car, a boat, subway, bus etc. Walk on slippery floors and meet strange people and dogs are no problem either. One can give him hugs but only when he wants it. As a younger dog he used to sleep in my bad, curled up next to me. Nowdays he likes to lay with his head on my tummy and be stroked over his head. Helthwise Akeron has been to the vet for a piece of glas in his paw....at old age we have done some seniorcheck-ups that has been ok! 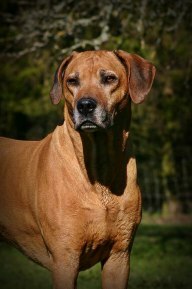 Akeron has offspring around Europe that has made their mark as being ecxellent family dogs of good to excellent type and of good health! I am very gretaful to the breeders who has chosen to use Akeron in their work and keept me posted on the "puppies" development and life!